Composable Nomination Classic Gold Sport American Football Rugby Charm, a stainless steel base link with 18ct Gold and Enamel. Composable Nomination Classic Gold Sport Baseball Charm, a stainless steel base link with 18ct Gold and Enamel. Composable Nomination Classic Gold Sport Basketball Charm, a stainless steel base link with 18ct Gold and Enamel. 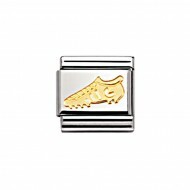 Composable Nomination Classic Gold Sport Football Boot Charm, a stainless steel base link with 18ct Gold and Enamel. 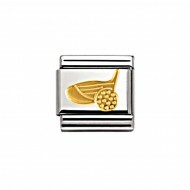 Composable Nomination Classic Gold Sport Golf 2 Charm, a stainless steel base link with 18ct Gold and Enamel. Composable Nomination Classic Gold Sport Golf Charm, a stainless steel base link with 18ct Gold and Enamel. Composable Nomination Classic Gold Sport Hockey Charm, a stainless steel base link with 18ct Gold and Enamel. Composable Nomination Classic Gold Sport Horse Riding Charm, a stainless steel base link with 18ct Gold and Enamel. Composable Nomination Classic Gold Sport Ice Skating Charm, a stainless steel base link with 18ct Gold and Enamel. Composable Nomination Classic Gold Sport Roller Skating Charm, a stainless steel base link with 18ct Gold and Enamel. 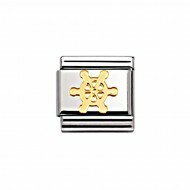 Composable Nomination Classic Gold Sport Sailing 1 Charm, a stainless steel base link with 18ct Gold and Enamel. Composable Nomination Classic Gold Sport Sailing 2 Charm, a stainless steel base link with 18ct Gold and Enamel. Composable Nomination Classic Gold Sport Tennis Charm, a stainless steel base link with 18ct Gold and Enamel. ComposableNomination Classic Gold Sport Volley Ball Charm, a stainless steel base link with 18ct Gold and Enamel.